At ArtFactory.com we restore all types of antiques, and collectibles. This includes antique musical instruments, such as this Chicago Cottage Organ Company pump organ from the 1890's. We also restore vintage vending machines, vintage visible gas pumps, antique toys, and even vehicles to museum quality standards. This Chicago Organ Company pump organ from the 1890's has been restored by our experts to fully working condition. When we do a restoration like this, we completely disassemble the machine so that each part can be cleaned, polished, and refinished. All original parts are kept, and the machine is restored to original manufacturer specifications. In other words, when we restore a product, we restore it to the same condition as a new instrument from the manufacturer would have been. That means that it will both look and sound like a brand new organ. Additionally, brand signage and finish colors are to original manufacture specifications. Most importantly, all machines are guaranteed to be in fully functioning, working order. Our restorations are the finest quality available anywhere due to our attention to detail, and the fact that no one has been doing it for longer. We restore old soda machines, slot machines, candy vending machines, automobilia, and more from the inside out. Any of our vintage restorations are guaranteed to the same functionality that would have been expected from a new machine or product ordered from the manufacturer. Furthermore, all of our restorations are done to historically correct specifications with original, period correct signage and paint schemes. To top it all off, all our our museum quality restorations are certified with the signature of award winning artist H.J Nick, as meeting world class fine art standards. This ensures an investment quality collectible with future appreciable value. 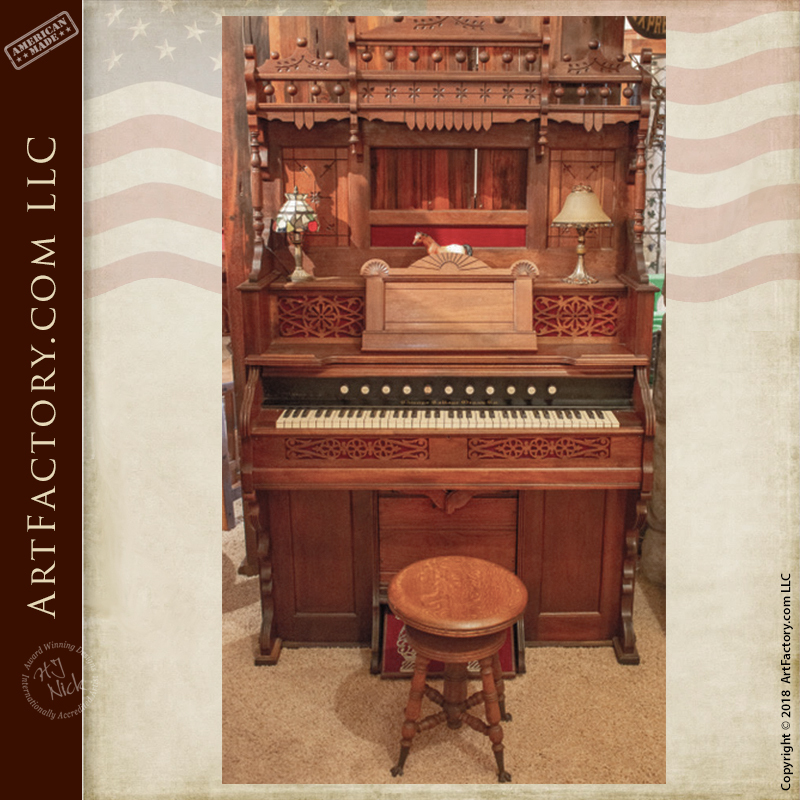 Call us today at 1-800-292-0008 for pricing on this Chicago Cottage Organ Company pump organ, of any of our restored collectible antiques.